Sometimes people ask what is my favorite place to see in Israel. I don’t know the answer to that. But one of my favorites is Mt. Carmel, not only because of Elijah’s victory over the Baal prophets which took place there (1 Kings 18), but also because of the view from there. From Mt. Carmel you can see the Jezreel Valley, trace the flow of the Kishon River, see Mt. 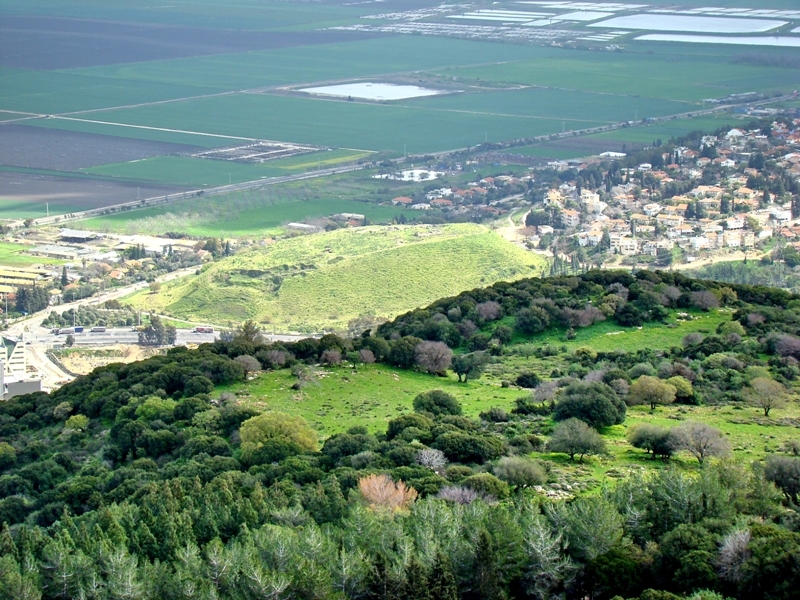 Tabor (Judges 4-5), the Hill of Moreh (Judges 7), the pass to Gilead, Mt. Gilboa (1 Sam. 31), the central hill country of Samaria, and the Mediterranean coast! Also you can see the ruins of Jokneam, one of the city states named in the conquest listing of Joshua 12:21. Jokneam in Carmel, listed in Joshua 12:22. Photo by Leon Mauldin. A city whose ruler was among the 31 Canaanite kings defeated by Joshua (Josh. 12:22), one of the Levitical cities of the family of Merari (Josh. 21:34). One of the most important Canaanite city-states, it appears in the list of conquests made by Tuthmosis III; it was possibly conquered later by Tiglath-Pileser III. The site was also settled in the Roman period, when Eusebius knew it as Kammona, ‘a large village in the Great Plain, 6 miles to the north of Legio, on the way to Ptolemais (Acco)’. Identified with Tel Qaimin, an exceptionally large mound at the entrance to Wadi Milh, one of the important passes leading into the Jezreel Valley. Since 1977 excavations have been carried out at Tel Yokneam under the direction of A. Ben-Tor on behalf of the Hebrew University, as part of a regional research project of the western part of the Jezreel Valley. This mound is outstanding by virtue of its continuous occupation. The following periods were found to be represented at the site: Ottoman, Mameluke, Crusader, early Arab, Byzantine, Roman, Hellenistic, Persian, Iron Age and Late Bronze Age. On the surface were also found potsherds of the Middle Bronze and Early Bronze Ages. One is benefited by seeing not only the well-known sites, but also the more obscure! Note that the above entry states that Jokneam was one of Canaan’s most important city states. This entry was posted on Thursday, March 24th, 2011 at 11:29 AM and is filed under Bible History and Geography, Bible Study, Carmel, Old Testament, Travel. You can follow any responses to this entry through the RSS 2.0 feed. You can leave a response, or trackback from your own site.